Logan has dozens of chain eateries and ice cream shops but only three bars, making it hard to find a place to really let loose after an Aggie win. Luckily, tucked below Main Street is The Factory Pizzeria, a dimly lit space that offers a few tables, benches, TVs and some of the best chewy, cheesy, deep-dish pizza around. Pair a giant pie with a pitcher of local beer and maybe a gooey calzone, and it’ll be difficult to find the motivation to ever climb the stairs back to Main Street. This is the kind of place that defies expectation. Yes, the Tandoori Oven is located in the same building as a gas station, in a remote agricultural/college town. But it might be some of the greatest Indian food you’ll ever eat—really. Cache Valley residents are fully aware of the secret, as the place is always packed with people getting their fix of the magical flavors Sham Singh and family conjure up in the kitchen. The menu is huge, with a few specialties that aren’t available at any Salt Lake Valley eateries, like chana saag: spinach cooked with garbanzo beans, onions, garlic, cream and spices. Indian-food newbies can get recommendations from the welcoming staff, but you can’t go wrong with anything from the tandoori oven, or the perfectly crispy, charred naan. If you’ve got a beating heart and a lactose-tolerant system, you love cheese. And cheese lovers will love Gossner Foods, a cheese plant with a small market where you can buy award-winning cheeses by the block, brick or slab. Originally known for its Swiss cheese, Gossner now also produces creamy Muenster, soft mozzarella, sharp cheddar and more, as well as cheese spreads and shelf-stable milks in various flavors. The plant is on the very western edge of Logan, so make sure to grab some tasty “squeaky” cheese curds for the road. It doesn’t look like much from the outside, but there’s a reason this tavern is the most popular hangout in Logan. As one of three bars in the whole town, the White Owl is the place for college kids, travelers and longtime residents to grab a drink, watch a game, play pool or pick someone up on the deck. It’s also huge, with an expansive main floor, a comfortable back room with a fireplace and huge TV, an actual pool hall with 10 tables, a small upper balcony overlooking the main room, and—the crown jewel—the upper deck. In winter, the deck downsizes to a small heated shelter—a cozy hangout in its own right, but summertime is when things go off the chain. The whole deck opens up, with nearly 20 tables, a second bar, and a grill with a burger-topping station. The White Owl is cash-only, but the bar’s ATM prints out a receipt for White Owl Bookstore, so you can fool your parents or your accountant. A drive through Logan Canyon provides views of some of the prettiest mountain vistas in Utah, especially in fall, when the leaves have changed into explosions of yellow, red and orange. To truly appreciate the beauty, hike up to the wind caves, also known as the Witch’s Castle. It’s a hike of just under a mile and a half, but it feels like more, thanks to the steep switchbacks. Once you’re at the wind caves, you can relax in the shade and cool off in the breeze that whips through the triple arches. They’re barely visible from the highway, but up close, the caves are majestic and somewhat terrifying, with steep rock floors—it seems that one false step or strong gust of wind might send you tumbling straight off the side of the mountain. 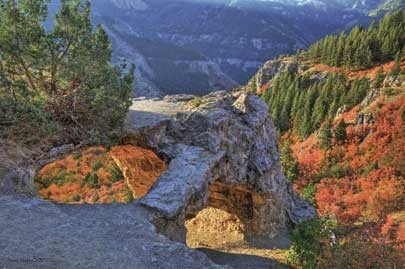 The view provides a sweeping vision of the Wasatch-Cache National Forest and the China Wall formation on the mountain directly opposite. With four locations in northern Utah (Ogden, Brigham City and two in Logan), the Old Grist Mill makes it easy to enjoy a budget-friendly lunch: a full sandwich, drink, chips and fresh-baked cookie will set you back just $5. Locals go crazy for the tasty sugar cookies, but the cookies of the day are must-tries, as well—especially the cowpie: a chocolate cookie loaded with milk-chocolate chips, white-chocolate chips and almonds. You can also load up on fresh breads by the loaf, whether you’re into basic wheat, crave sweet cinnamon bread, or want to try something new, like spinach-feta sourdough. At nearly 100 years old, The Bluebird restaurant is practically synonymous with Logan. The sprawling eatery’s dark paneling and soft carpets add an air of elegance to the menu of American favorites like burgers, sandwiches, Prime rib, mashed potatoes and housemade rolls. But if you’re not looking for a full meal, The Bluebird has a stool at the soda shoppe counter with your name on it. All sodas are hand-mixed, rendering even familiar drinks like Cherry Coke into something magical. But don’t miss the Ironport, an old-timey Western root-beer-esque drink with an extra spicy kick. For a truly vintage experience, pair your soda with a dessert: The classic Teddy Bear sundae is a decadent pile of chocolate ice cream, chocolate caramel topping, Oreos, M&Ms, whipped cream and a cherry. You might think you’ve had enough sugar, but the cravings will be back again tomorrow, so make a stop at the Bluebird candy counter before you leave and pick up some handmade Alvey’s Candies for the road.